Something I’ve noticed as I read through various Golden-Age Flash Comics is a repeated subgenre in which the Flash plays an entire team. 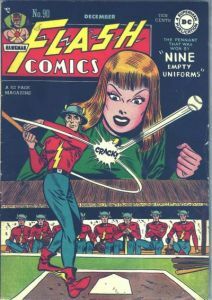 “Nine Empty Uniforms” (Flash Comics #90, 1947) is the first one I read, since it was reprinted in an 80-page Giant. The bad guys cause problems for a baseball team, so the Flash takes the place of every single player in the upcoming game. As I’ve picked up comics from the 1940s, and the new Archive book, I’ve found more. 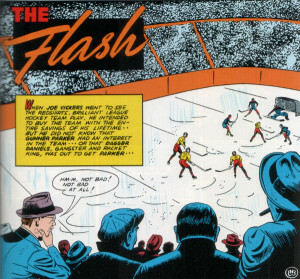 In an untitled story from All-Flash Quarterly #1 (1941, reprinted in The Golden Age Flash Archive Volume 2), racketeers hassle a hockey team.The owner needs the money from the “Manley Cup” for an operation for his daughter, so when the racketeers force the players to sit the game out, the Flash steps in. 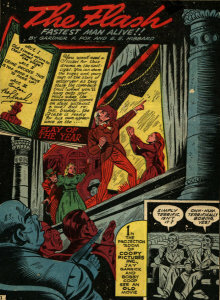 “Play of the Year” (Flash Comics #39, 1943) breaks with tradition a bit and instead of a sports team, the Flash replaces a troupe of actors. 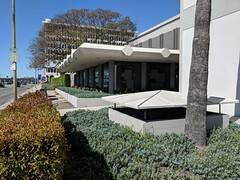 A rival producer tries to financially ruin one of Jay’s friends by preventing his play from opening, in this case faking a measles outbreak among the cast and putting them in quarantine. Once again, the Flash steps in and plays every single role, changing costumes and switching places faster than the eye can see. The weird thing about these stories is that nowhere does anyone suggest that having a super-powered player—who isn’t even on your roster—just might be cheating. It goes all the way back to his first appearance in Flash Comics #1: Back in college, Jay Garrick was a football scrub. After the accident gave him super-speed, he convinced the coach to put him on the field so he could show off in front of his girlfriend, Joan. Interestingly, later retellings of the Flash’s origin make it a point that he quit the team immediately afterward because staying would have given him an unfair advantage. This entry was posted in Comics, Highlights and tagged Flash, Golden Age, Repost Source, See Also: Speed Force, sports on June 5, 2006 by Kelson.